Productive Droid: Google Photo's is amazing! I am not sure when it happened, but suddenly Google Photo's became amazing. If you are not aware, you can choose between two modes of file storage. 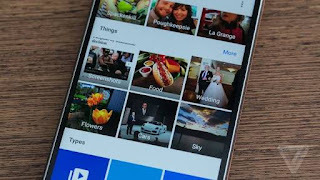 You can choose to store your photo's at the same quality that you took them, OR if you choose the standard photo storage size, you get unlimited (yep you read that right) storage of your photo's in Google Drive. Forever. That's it. No catch. That is the hook that first got me started. However, the app on Android and then the web site just seemed to make a rapid number of incremental changes until it is now one of the apps that I use frequently, and it is a joy. I think that unless you are in the media industry and have a need for particularly large files sizes for your photo's, the standard setting (which is called "high quality") is really all the average photographer needs. What is great about Google Photo's is, like most of Google's apps these days, it is available on iOS. I have helped two of my Apple totting friends with stuttering iPhone's take advantage of the feature that removes photo's from your iPhone once they have safely been backed up to Google Drive. The free space, improved performance, ease of use and the way that we can now collaborate on projects together seamlessley across the ecosystem divide have made them rubberneck by Nexus 5 at least one time a peice. Get on it. Google Photo's is great.